Those lights likely run on differernt voltages so the short answer is no. 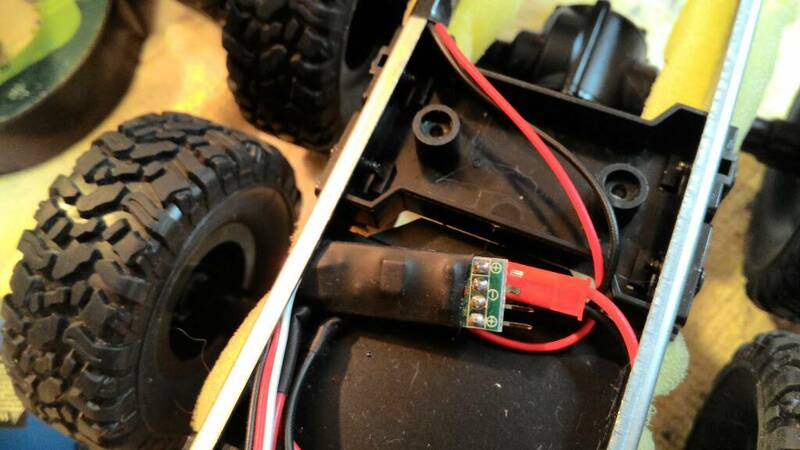 I would recommend the Turnigy light control unit from Hobbyking as a switch, but you might need more than one (or at least some carefull balancing of resistors in the circuit) to get everything to light up how you want it? Cheers. I may have to down, test and adjust then. I may well stick with the standard wiring for the head/tail lights and use a separate channel for the beacon! As a rule red and white LED's have different forward voltages and don't play nice on the same power supply. I've successfully done this on a large range of WPL etc 1/16 trucks. I have front and rear lights plus yellow flashers and internal lights, all on one channel on the same trannie as you. Buy the appropriate colour/functioning LEDs, all 6v, then buy a single multi-switch off eBay. This plugs into your chosen receiver channel socket, has a short cable to a very mall circuit board which has 2 or 3 two pin male pin sets, each of the pair's supplying switched 6v for your LED sets. You can add resisters to reduce brightness but because the supply is from your receiver its all 5-6v bec. Use switch A to control the channel and you can then cycle through light sets, both single and pairs etc. The switches vary in the number of light sets supported, the combinations and price but few are more than a fiver so cheap, easy to install and use work a treat. The hardest bit is using the right words to search on ebay! 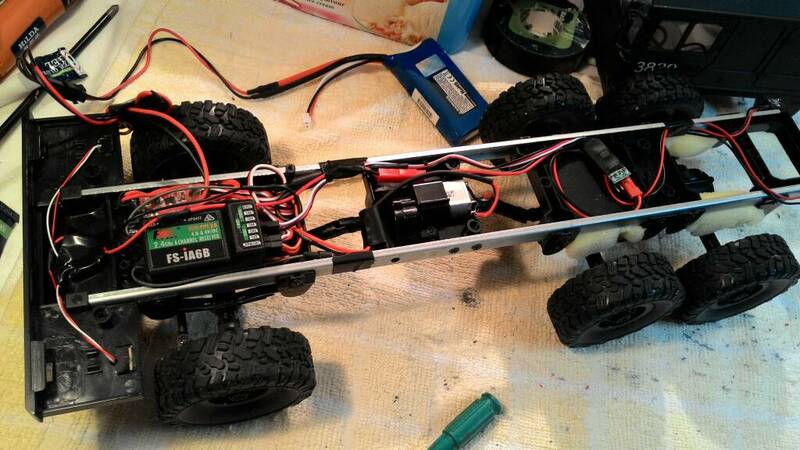 General Jumbo01 wrote: I've successfully done this on a large range of WPL etc 1/16 trucks. I have front and rear lights plus yellow flashers and internal lights, all on one channel on the same trannie as you. These are mostly unbranded so your RC shop may not have them but here's a simple 1 channel / 2 switch example. This one gives two switches that gives you one set on, other set on, both sets on, one set cycling through effects for example. There are a couple of branded ones but they cost a lot more! Ignore the reference to '2 channel's - they only use one! General Jumbo01 wrote: These are mostly unbranded so your RC shop may not have them but here's a simple 1 channel / 2 switch example. This one gives two switches that gives you one set on, other set on, both sets on, one set cycling through effects for example. There are a couple of branded ones but they cost a lot more! BK - this appears to be a single switch so would this be of any benefit to you? Given the output of the receiver will be no more than 5 to 6 volts (BEC) you don't need or want more. Try a simple 2 switch example first - cheaper and more function! You burnt the led. You should not use an esc but an electronic switch. Anyway you always have to check the output voltage and to check the voltage the led needs. If it is the same, no problem. If the led receives overvoltage you will burn it, so you need to fit a resistor. A led when working, is never hot. Edit: Im using the same electronic switch as general jumbo in my watchtower. Edit 2: Yes, I know you can also use a mini esc as a switch, but is overcomplicating the things, lol. Last edited by Rad_Schuhart on Sun Mar 17, 2019 10:41 pm, edited 1 time in total. Hi Raul, the led was running from a spare channel on my receiver, i was using the esc as a power source, would this still be the problem? The clue could be the word 'cheap' but l use cheap Chinese ESCs in cheap trucks and they've all been fine. Maybe the LED was substandard? The white LEDs on the WPL etc trucks often blow after the electronics are upgraded to hobby grade so maybe cheap LEDs are the cause. Does the esc still work okay? Getting confusing. So the LED was not a part of the ESC? Model Builder 4 wrote: Hi Raul, the led was running from a spare channel on my receiver, i was using the esc as a power source, would this still be the problem? A warm white led, with 3.4 v is toasted. A red with about 2 will be toasted. So if you stilk want to use an esc, you need to fit a resistor, OR control the output of the esc with a potentiometer in your radio or so. Here's a useful refresher on using LEDs in models. It might help a little. A few were duds from the outset, but I've had good use from others. Cheap as chips Chinese.